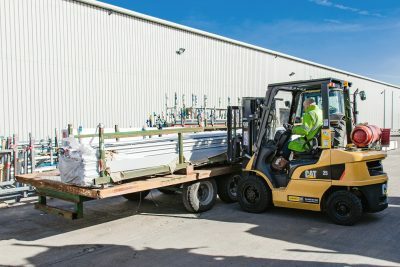 Window and conservatory systems manufacturer Synseal has updated its materials handling fleet with 28 new trucks on full-service contract hire, after Impact’s proactive maintenance programme and provision of quality equipment contributed to a 100% customer service record. As distributor for some of the world’s best-known manufacturers, Impact has provided a mix of materials handling equipment to Synseal for more than 15 years. The company ensures its engineers work outside of the customer’s peak operating periods to carry out routine maintenance and proactive fleet inspections, which maximises fleet uptime. The latest order includes a mix of 16 gas-powered Cat® lift trucks, 10 Combilift multidirectional forklifts, one Aisle-Master narrow-aisle articulated forklift and one wire-guided high-level order picker. Most will be based at Synseal’s Huthwaite headquarters in Nottinghamshire, with others split between the company’s three sites in Barnsley, Blackburn and Wigan. Synseal was established in 1980, initially fabricating aluminium and PVCu windows and doors. Today, the company manufactures roofing systems, windows, doors, hardware and support structures for conservatories. It operates in excess of 100 pieces of materials handling equipment, more than 90 per cent of which has been supplied by Impact.